World War III: We're not seeing the beginning of a world war in Syria, but that's no cause for comfort. What Do We Really Mean by “World War III”? 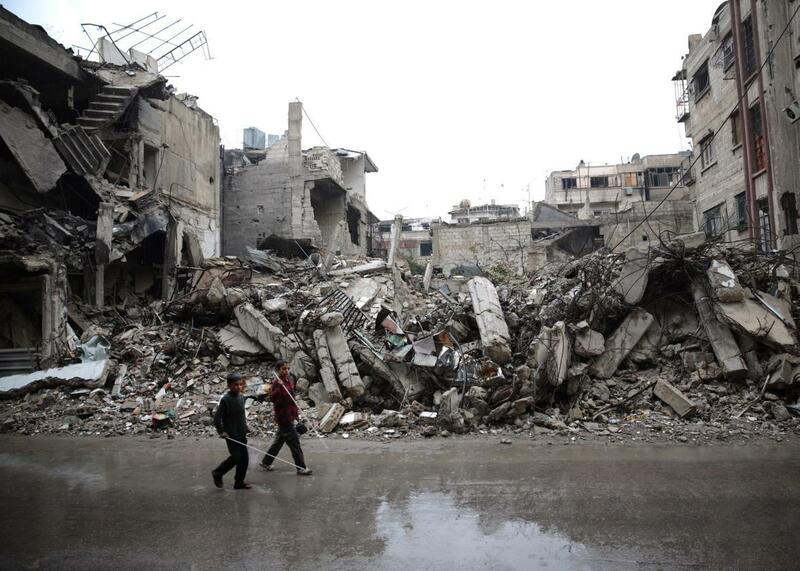 Syrian children walk past the rubble of destroyed buildings in the rebel-held area of Douma, east of Damascus, Syria, on Nov. 17, 2015. Shortly after a Russian jet was shot down by Turkey under disputed circumstances on the Turkish-Syrian border on Tuesday, the hashtags #worldwarIII and #worldwar3 quickly spiked on Twitter. The news also unleashed a flood of commentators and experts reassuring readers that World War III is not likely to break out. They’re right, but it’s worth considering what we mean by “world war” and what that question leaves out. Many of the people using the hashtag likely fear a World War III that would resemble the previous two—direct conflict between multiple industrialized nations with large militaries—only much scarier given that more than one side now has access to nuclear weapons. This is unlikely to happen because of Tuesday’s incident or the Syrian conflict generally. Russia clearly miscalculated, assuming that Turkey would tolerate Russian jets buzzing its airspace the way that Turkey’s NATO allies have. It didn’t. Russia isn’t going to just let this slide. It may support covert action against Turkey, perhaps backing militant Kurdish groups or redoubling its efforts to contain Turkish political influence in the Middle East. Russia is also Turkey’s main natural gas supplier and could raise prices or cut off the supply entirely. Still, Russia’s unlikely to risk a shooting war with NATO, which it would lose, and certainly not over Syria. Russians were willing to accept economic hardship and international isolation over the war in Ukraine, fought for territory that the country’s people have long considered rightfully theirs. As Max Fisher noted in Vox, the conflict in Syria is less of a priority and less popular among Russians. The Kremlin’s early reluctance to acknowledge that a terrorist bomb likely brought down a passenger jet in Egypt in October may have been a sign that Russia’s leaders aren’t so sure of how high a price Russians are willing to pay for Putin’s intervention on behalf of Bashar al-Assad. Vladimir Putin’s MO for military action has long been deniable, quickly reversible “hybrid warfare” in situations where he knows he’s likely to face limited retribution. If he wasn’t willing to start World War III over Ukraine, he won’t start it over Syria. That being said, there’s a separate conversation over whether the Syrian conflict already is, in fact, a world war. Jordan’s King Abdullah has suggested as much recently, as has Pope Francis. * After all, the war in Syria has drawn in direct and proxy intervention from more than a dozen countries. It has spawned multiple fronts and overlapping alliances. It has spread into Iraq and challenged long-standing national borders. It has involved wanton brutality against civilians including genocide. It has sparked ancillary violence in neighboring countries and as far away as Paris. It has directly led to the worst refugee crisis the world has faced since World War II, not to mention the deaths of between 200,000 and 310,000 people, depending on the estimate. Wars today are more likely to be fought within individual countries between governments and insurgents, rather than between separate national armies over territory. While these wars can involve multiple countries, these countries are participating more often by proxy than through direct confrontation. Devastating and destabilizing as these wars can be—and Syria is about the worst-case scenario for one—they’re still less deadly than the world wars of the 20th century. That’s at least one reason why its plausible to say that the world is getting more peaceful despite the daily atrocities we witness around the globe. This trend won’t necessarily last forever, of course, and what people are really asking when they wonder about the possibility of “World War III” is if we’ll see a return to the even more devastating form of warfare seen in the 20th century. We’re not there yet, though the unfolding catastrophe in Syria is pretty terrifying for what it is on its own. *Correction, Nov. 24, 2015: Due to an editing error, this post originally misidentified Jordan’s King Abdullah as Saudi Arabia’s King Abdullah, who is deceased.